The fixed 15mm focal length equates to 30mm in 35mm terms and offers a wide-angle field of view. The aperture is also fixed at f/8 and as the lens is only 9mm in length the complete camera and lens combo will fit in a large pocket. That makes it an interesting option for discreet street photography and photojournalism, or for photographers who like taking their Micro Four Thirds camera everywhere. Its diminutive proportions don’t leave a lot of room for glass however and the Olympus 15mm 1:8.0 body cap lens features an arrangement of just three elements and no contacts for communicating with the camera. That means no EXIF data is recorded and there’s no autofocus either, but you can focus manually using a mechanical lever. The lever offers three settings; closed for storage, 30cm minimum focus for close-ups, and Infinity for greater depth-of-field. It’s quirky but costing just $49 it’s cheap and offers you something a little bit different for not much money. Let’s take a look at how it performs. Note for this review: All tested lens scores are displayed with the Panasonic GH2, because the GH2 is the more resolved sensor available for now. Measurement on Olympus OM-D EM-5 will be shortly available. You’ve probably worked this out already but the Olympus 15mm 1:8.0 Body Cap Lens is not optically one of the strongest lenses on the DxOMark database. In fact with an Overall DxOMark Score of 4 tested on the Panasonic GH2 or just 2 tested on the Olympus PEN EPM1 it ranks bottom in 2872th place. In all our Lens Metric Scores its performance leaves a lot to be desired and a Sharpness Lens Metric Score of 3P-Mpix again places it bottom of the rankings. Sharp pictures are out of reach therefore and with heavy vignetting of -1.5EV and a Chromatic Aberration Score of 30um you’re going to be busy correcting in postproduction to get a decent image. 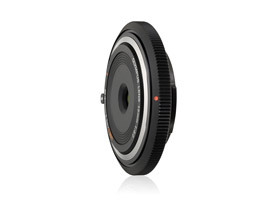 Optically the Olympus 15mm 1:8.0 Body Cap Lens is extremely weak and ranks last, in a whooping 2872th place at the base of the DxOMark Lens Database. But that’s not really the point. No photographer buying a $49, 9mm long body cap lens is expecting optical perfection. Instead this lens is a bit of fun, a curiosity, a point and shoot option that’s a bit quirky and doesn’t cost much money. The limited focusing, fixed 15mm focal length and f/8 aperture will be overly restrictive for some and the latter means you’ll need to shoot in decent light, unless you’re really going to crank up the ISO. Those restrictions however will often make you work in a different way and who knows, you might be pleasantly surprised by the results.